A tour group riding quad bikes in remote Otago high country did not have permission to be on the land where a crash killed two of the party on Saturday afternoon, the station owner says. 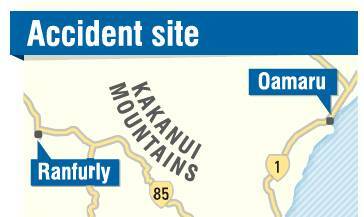 Police have launched an investigation and WorkSafe has been notified after the crash in the Kakanui Range, east of Ranfurly, where two people died at the scene. Dome Hills Station owner David Douglas said the crash happened on a remote part of his 7500ha station, but he was unaware the group was operating on his land and it had not sought permission. "They didn't ask permission and we knew nothing about it. They were there without our knowledge." He would not disclose the name of the company allegedly involved and referred that request to police, who also would not name the company or people behind the tour. The crash happened in rugged country near Crumb Hut, one of two huts on a remote part of the large station on the northern side of the Kakanui Range, he said. "It's dangerous country - you've got to know what you're doing when you're up in places like that." He was unsure if a fence would have needed to be cut for the group to access his land. "We're going to find all that out." It was also the first time he had heard of the group riding on the station, he said. A police spokesman said formal identification of the bodies was under way. The crash was reported about 4.30pm on Saturday and it was understood eight people were in the area riding quad bikes at the time. A Land Search and Rescue group from Dunedin was deployed to the area by helicopter to assist in extracting the two bodies, while an Otago Regional Rescue Helicopter was also dispatched. Police would not say if the dead were New Zealanders or foreign nationals, or whether any arrests have been made. The Danseys Pass Trail Ride was taking place on the same day but a spokeswoman for the ride said those involved in the crash were not taking part in the event.